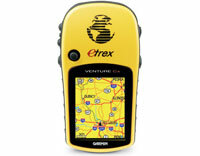 Garmin eTrex Venture Cx (010-00560-01) €299.00 - buy online at mysatnav.ie - Ireland's leading GPS & Sat Nav store. Storing data is easy with Venture Cx's microSD card slot which is located inside the waterproof battery compartment. You can use optional preloaded microSD cards with MapSource� City Navigator NT street-level map data for turn-by-turn directions and Bluechart� marine map data. Free contour maps of Ireland are available from the Scottish Mountaineering Club (but you must follow the SMC instructions carefully for downloading the map data to your device). This popular GPS system with a bright colour screen is perfect for excusions both on and off road. The micoSD card slot allows you to have expandable memory and you can also use MapSource data cards for detailed street maps and sea adventures.